Travel photography includes just about every photographic category you can imagine, including portraits, landscapes, and destination wedding photography to name a few. With the rise of digital cameras, getting into digital photography has opened the door for everyone to become a photographer. It’s now much easier to capture what you discovered and record the beauty that surrounds us. Here are 3 factors to ground yourself in capturing fine art photographs when traveling or shooting destination wedding photography. It can be useful to keep in mind what you would like to take pictures of prior to going out to do so. After you have identified your suitable location, try to go back at various times during the day to discover changing lighting and weather situations if possible. Effective planning and seasonal awareness can guarantee that you won’t miss it. Do keep track of the time of sunrise and the moon cycle as well. But do not leave out the opportunity to capture the unexpected. While preparing your gears, listen to some music that will stimulate your imagination and picture the world you see. Light sets the mood of your image and can enhance any scene, at times giving a feeling of mystery as it paints the landscape. Time of day refers to the sun’s intensity and for that reason has a great effect on lighting scenarios. The light at the beginning and the end of the day is actually not the same as that at midday. So learn how to photograph using every type of light available. Observe where the light is coming from. Check the color temperature of light to set the mood of the image. Oftentimes it’s not sufficient to have control of ISO, aperture, and shutter speed. Having neutral density filters can help. Experiment with different focal lengths or zooms while composing your image. Consider how much to include or exclude when framing the scene. Sometimes less is better. Have something interesting in foreground, middle, and background to hold the viewer’s eye longer. Remember to get down low or climb up high to get a unique angle. Don’t settle for the obvious vantage point. Rather than visiting a gallery or a well-known restaurant on your upcoming holiday or family trip, let yourself be in the Halloween spirit by exploring haunted locations. The world is loaded with weird adventures and escapades that you can capture with your digital SLR. Here are a few creepy places to inspire you and make you travel to a destination near you. The Sedlec Ossuary found in Kutná Hora is a Gothic-style church back in 1400 that was being constructed adjacent to a graveyard and had been utilized as an ossuary for the burial plots that have been dug up. A woodcarver known as Frantisek Rint had been appointed to set the now huge stacks of bones and created designs out of it. It is claimed to hold the bones of almost 40,000 people. The Island of the Dolls or Isla de las Munecas as recognized in Spanish, is situated in the south of Mexico City. A hermit referred to as Don Julian Santana renounced the world to live in the island and delight the spirit of the little girl who had drown inside the canal. It is currently home to countless mutilated baby dolls hanged all over the place with decapitated scalps and bare eyes. Don Julian is dead to the world but his eerie disturbed vision stays on. The oldest and largest Old Jewish Cemetery in the city of Prague made its first burial around 1439 and the final burial took place in 1787. These more than 12,000 tombstone have their inscriptions in Hebrew. Popularly known as Dracula’s Castle, Bran Castle inside Transylvania was constructed by the Saxons in 1932 to guard the Bran Pass up against the Turks. It is regarded as the national monument and landmark in Romania. The castle is currently a museum available to tourists, exhibiting art and furnitures collected by Queen Marie. Being a symbolic representation of the Holocaust, Auschwitz in Poland was a large concentration camp back in 1942 to 1944. Jews were directed there coming from all over Europe to pass through selection and to be killed in gas chambers. This torture center is the essence of evill and horror constructed by people to murder another human being. At present, the grounds and most part of the structures that remain intact are open for tourist. The Hill of Crosses in Lithuania is known as a place of pilgrimage dating back to 1831. Through the years, crosses, crucifixes, rosaries, and Virgin Mary statues were left by Catholic pilgrims as a way of Christian devotion and memorial to Lithuanian nature. The sheer numbers of crosses is unidentified, but reports indicated at around 50,000. Amityville is known to be haunted because of a mass murder which took place on November 13, 1974 with the DeFeo Family. Thirteen months later, the Lutz Family inhabited the residence however left 28 days later after making claims that the house was haunted. The Valley of the Kings is a royal burial grounds for the most powerful pharaohs of Egypt since 2000 BC. 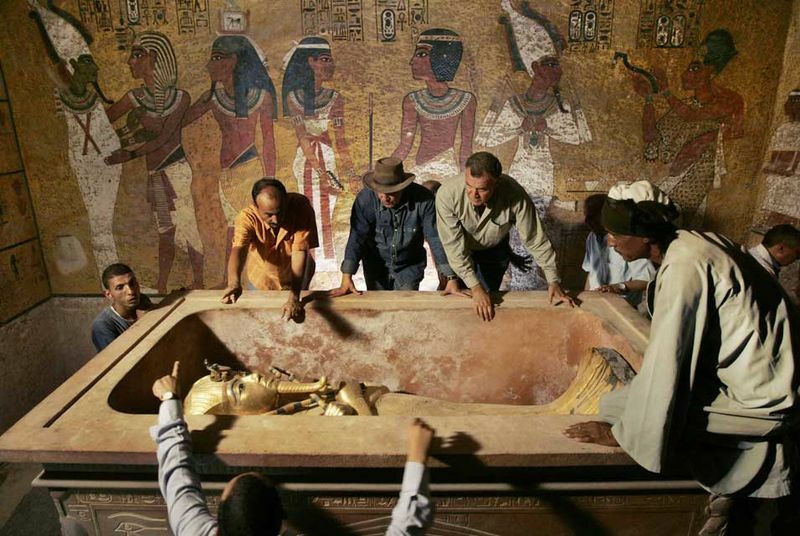 The intricacy of the tomb of King Tut required extensive massive labor to build and had taken many decades to finish in the Valley of the Kings. Ancient workers burrowed intensely straight into the limestone cliffs digging out chambers and subsequently embellishing them with enchanting artwork. The two-story Waverly Hills Sanatorium opened in 1910 to accommodate 40 to 50 tuberculosis patients in the hospital. The building is too small to handle all the patients. That’s why a new building was built in 1924 and opened in 1926. The Death Tunnel is another popular haunted area. One of the uses for this tunnel was transporting dead bodies out of the hospital. Also referred to as the Rock, Alcatraz was America ‘s top maximum-security prison as well as the last stop for the country’s most notorious prisoners through the mid 1930’s until the mid 1960’s. The now vacant cellhouse that has been occupied by the most dangerous criminals still holds remnants of the dreary proceedings to which these wall structure once bore witness. Allegations that Alcatraz was escape-proof were not precisely correct. In the prison’s 30-year record history, 34 men tried to escape in 14 occurrences; 29 men were captured. The missing five were assumed dead, but their real destiny is a mystery. A few claim Stonehenge was a historical temple. Other people point out that it was an astronomical observatory for jotting down important events. An additional theory indicates it was a grave for the elite. The late president of the Philippines, Ferdinand Marcos, built the expensive Manila Film Center. However the late president required it to be finished in time for its inaugural film festival. After doing adjustments to the building plan to accelerate the construction, an accident happened in November 17, 1981. The scaffold hit bottom causing workers to get caught in wet cement. Several workers have been stuck and buried alive considering that the cement was setting at the time. It was believed to be haunted by ghost of workers buried underneath. Behind the assembled piles of skulls, tibias, and femurs in the Paris catacombs is a chaos of bones. In the 18th and 19th centuries the city dug up an incredible number of skeletons from over-flowing cemeteries and added them at night into old quarries. The Hellfire, or West Wycombe Caves, is actually a collection of man-made caverns designed into the chalk scenery underneath a church in West Wycombe. The caves were commissioned in the 1700s by Francis Dashwood, who utilized them as a assembly place for his Hellfire Club, whose members were notorious hedonists. The caves are accessible to the public today, and are considered haunted.